By Shahrokh Meskoob. Translated by Michael Hillmann from the Persian. Edited by John R. Perry. Foreword with Author Interview by Ali Banuazizi In History Tagged In Social Science and Sociolology. In this insightful study of Iranian cultural history and national identity, the late Shahrokh Meskoob, one of Iran’s leading intellectuals, reviewed the roles of three social classes, the courtiers and bureaucratic officials (ahl-e divan), the religious scholars (ulama), and the Muslim Gnostics (Sufi poets and writers), in the development and refinement of the Persian language during the past 1,000 years and gives the reader a fresh perspective on Iranian cultural heritage and the struggle to forge a distinct national identity. Dr. Ali Banuazizi’s foreword and interview with the author sets the stage for a fuller appreciation of this invaluable and wide-ranging contribution to Iranian intellectual history. What comprises the Iranians’ sense of “Iranianness”–that unique amalgam of shared history, religion(s), language(s), myths, artistic expression, sentiments, and traditions that has provided them with an enduring and resilient cultural identity as members of one of the world’s oldest civilizations? How widely–and deeply–is such an identity shared by the various ethnolinguistic groups that live within the boundaries of the present Iranian state and by those in Afghanistan, Central Asia and the Caucasus who share their language and much of their cultural heritage with Iranians? And how variable has been this identity in the various periods of Iran’s cultural history? While these questions are certainly not new, they have gained much greater significance with the political upheavals that followed the Iranian Revolution of 1979, the initial efforts of the Revolution’s clerical leadership to forge a new cultural identity for Iranians as an “Islamic nation,” and, more recently, the surge of ethnic assertiveness and conflict in several of Iran’s neighboring states in Central and Southwest Asia. Of the various elements that constitute Iran’s cultural identity, four have traditionally been judged the most salient. These include: (1) the country’s pre-Islamic legacy, which took shape over a period of more than a millennium, from the time of Achaemenians to the defeat of the last Persian dynasty (the Sasanians) by the invading Arab armies in the middle of the seventh century; (2) Islam, or, more specifically, Shi’ism, the religion of over ninety percent of the country’s present-day inhabitants, with an all-encompassing impact on every facets of Iranian culture and thought; (3) the more diffuse bonds, fictive or real, established among peoples who have inhabited roughly the same territory, with the same name, faced the same enemies, struggled under the same despotic rulers and conquerors, and otherwise shared the same historical destiny for over two millennia; and finally (4) the Persian language, currently the mother tongue of a bare majority of the population, but long the literary and “national language” in Iran (as well as in parts of Afghanistan, Central Asia, and parts of the Indian subcontinent). The relative weight to be given to each of these, partially overlapping, elements in defining the Iranian national identity has generated much controversy among the successive generations of modern intellectuals in Iran, particularly since the last decades of the nineteenth century when the question of national identity moved to the center stage of the political discourse. The focus of the present work by Shahrokh Meskoob, one of Iran’s leading contemporary authors and cultural historians, is on the last of the above elements–i. e., the Persian language–and its role in forming and sustaining the Iranian national identity. The author stresses the fact that following the Arab conquest of Persia in the seventh century C.E., it took Persians well over two centuries to recover from their humiliating defeat, a defeat which entailed not only the crumbling of their political order and subjugation to foreign rule, but also the imposition of a new religion and language on them. In the struggle to regain their cultural identity as a separate people, their most important recourse was to their pre-Islamic history, as remembered, imagined, and reconstructed, for the most part, in the mytho-historical narratives, “books of kings” (the shahnamehs) composed in this period, of which Ferdowsi’s Shahnameh (1010 C. E.) is the preeminent example. The use of Persian in these and other works gradually established it as the principal literary language and, as such, the feature that most distinguished the Iranians from the rest of the Islamic world. In Meskoob’s words, “Only with respect to two things were we Iranians separate from other Muslims: history and language, the two factors on which we proceeded to build our own identity as a people or nation. History was our currency, the provisions for the way, and our refuge. Language was the foundation, floor, and refuge for the soul, a stronghold within which we stood” (p. 13). This reclaiming of cultural identity by the Persians, it must be emphasized, however, never acquired the character of an anti-Islamic impulse. Indeed, the acceptance of Persian as the second language of Islam brought to it a certain measure of sanctity. The increasing acceptance and use of Persian, especially in its written form, in the Iranian world as the principal language for formal communication and literary expression served as one–if not the key–link among the many peoples that comprised the Iranian civilization. The core of Meskoob’s book is his assessment, through a careful review of hundreds of literary, religious, and mystical works by Persian-speaking authors from the tenth to the end of the nineteenth century, of the role of three major social groups–the courtiers and bureaucratic officials, the religious scholars (the ulama), and the Muslim mystics (the Sufis) in the spread and flourishing of Persian in the Iranian cultural world. Of the three groups, he finds the ulama contributed the least to the development of Persian; the most eminent among them preferred to write in Arabic, and their use of Persian was mostly for purposes of oral communication with the masses. The two groups that served as the “guardians” of the language and helped in its flourishing and further refinement as a major literary, diplomatic, and administrative language in Iran and elsewhere were the Muslim Gnostics (the Sufi poets and writers) and those in the employ of the royal court and state-bureaucratic apparatus (ahl-e divan). 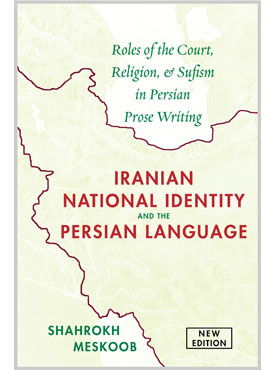 It is precisely this emphasis on the role of particular social groups in the development of the Persian language and literature that sets Meskoob’s analysis apart from the more conventional approaches to Persian literary history as pursued, for example, in the works of Edward G. Browne, Jan Rypka, and Zabihollah Safa. Where the latter authors followed a chronological approach to the development of Persian literature in relation to its general historical and cultural contexts, Meskoob seeks to show how the particular sociocultural positions held by the aforementioned groups helped determine the nature and extent of their respective contributions to the development of the Persian language. His study, therefore, offers an excellent example of a sociologically sensitive analysis of Iranian cultural history and identity. Meskoob’s examination of the role of the Persian language in the formation and continuity of Iranian identity ends with the Constitutional Movement of 1905-11. He maintains that with the political and social changes that took place in the closing decades of the nineteenth century, and with Persia’s increasing contact with the West, the three social groups on which his analysis is focused lost their significance as the principal guardians, practitioners, and promoters of the Persian language. In all these capacities they were gradually replaced by a new social group in the Iranian society, i.e., a secular intelligentsia consisting of journalists, writers, poets, etc. An analysis of their role vis-a-vis the Persian language, and in relation to the masses and the state, as the author rightly points out, lies beyond the scope of the present work. Aside from his deep knowledge of cultural history, what the author brings to his survey of the evolution of the Persian language and its relation to the Iranian national identity are his insights and skills as one of Iran’s foremost literary critics. His own masterful use of the Persian language, his interpretive works on Persia’s most celebrated classical poets (Ferdowsi and Hafez), and numerous other translations, literary and philosophical essays, and short stories give special authority to his views on what is undoubtedly one of the most difficult problems in Iranian intellectual history. * We are also very fortunate to have had Michael Hillmann, one of the leading scholars of Persian literature in United States, translate this work into English with extensive notations that clearly enhance its value and usefulness to the English reader. Shahrokh Meskoobwas born in Babol on the Caspian coast in 1925. His major published works include translations of Sophocles’ Antigone, Oedipus Rex, and Steinbeck’s Grapes of Wrath; he has also written Moqaddame-‘i bar Rostam va Esfandiar [a study of the ethics of Ferdowsi’s Shahnameh]; Soug-e Siavosh [a study of the myth of martyrdom and resurrection in the Shahnameh]; and Dar kuy-e dust [an interpretive study of Hafez’s views on man, nature, love, and ethics]. The Persian edition of the present work was first published in Paris under the title of Melliyat va zaban. Since the 1979 revolution Shahrokh Meskoob has been living and working in Paris. Ali Banuazizi was born in Tehran and currently teaches social psychology and modern Iranian history at Boston College. He served as editor of the journal Iranian Studies from 1968-1982, and is the author of a number of works on contemporary Iranian society and politics. Send email to Ali Banuazizi.